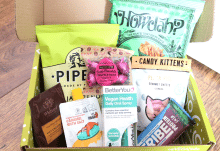 Mask Time is a fantastic subscription box that specialises in bringing you the best Korean beauty brands and facial masks straight to your door every month, so if you love skincare and pampering treats, this is the box for you! 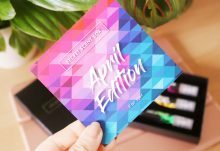 March’s Glow Setter Box is a special collaboration as it introduces the Korean brand 9CC to subscribers with a range of their products for you to try. This brand uses Marine Technology which is powered by the ‘energy of the South Korean sea’ to ensure a healthy and hydrated complexion. All of the products are free from parabens, mineral oils, fragrance and alcohol which is great, so let’s see what’s inside, shall we? 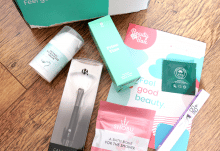 Usually, the Mask Time boxes are filled with sheet masks so I was a little surprised to see two full-size tube products instead, but don’t worry – these are really good products! The first one is a brightening cream moisturiser that can be used by all skin types. It uses natural, hydrating ingredients such as Algae and Tahitian Black Pearl extract to provide long-lasting moisture that will keep your skin healthy and happy all day long. The next tube product is a Purity Sea Foam Cleanser and this is the perfect cleanser to use before the moisturiser above – the pair work very well together! This low irritant foam cleanser provides nourishment and contains ingredients that help to calm the skin, enhance elasticity and prevent it from drying out. There are Coconut extracts to moisturise, and Black Olive and Squalene to prevent environmental factors from damaging the skin. Moving onto the sheet masks, I found three different ones in the box from 9CC. This one is called the Juste Blanchment Masque and it’s brilliant for keeping your skin glowing and moisturised all day. Key ingredients include Black Pearl to improve the appearance of wrinkles, Niacinamide to brighten dull complexions, Green Algae to enhance hydration, Aloe to help heal damaged skin and Vitamins B5, E and C are included to treat skin problems such as Rosacea, Acne and Eczema, whilst also moisturising and balancing the skin. For a real anti-ageing and glow-promoting treatment, try the Sea Collagen Heben Maske. This mask features Sea Cucumber which is high in natural collagen to help speed up cell renewal, firm the skin and boost blood circulation, whilst Peptides provide anti-ageing benefits, Witch Hazel fights acne and blemishes and Mexican Cactus extract is a natural moisturiser that keeps the skin hydrated for 24 hours. The last mask is particularly beneficial for blemish prone and acne skin types, so if spots and impurities are upsetting you, it’s a must-try. With a potent mix of botanical extracts, this mask will help you to say bye-bye to blemishes and leave your skin looking brighter and more revitalised. It uses Tea Tree for its anti-bacterial properties, Purslane to help refine the skin, Liquorice to reduce excess sebum and Chamomile which has natural anti-inflammatory benefits to reduce irritation and redness. Although it's a different selection from previous Mask Time boxes, I enjoyed the themed introduction to a brand that I hadn't heard of before and the bigger tube products will last a lot longer than the sheet masks so it's great value for money.